A short overview of the possibilities of research with use of the reactor or other related instruments. For more information please call mr. M. Blaauw +31 (0)15 278 3528 or send an e-mail. The neutron as well as the positron facilities can be used with European funding. 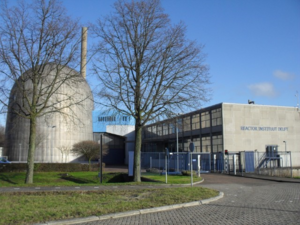 The Hoger Onderwijs Reactor (HOR) is our main source of radiation. It produces neutrons, positrons and hard gamma rays. The Co-60 irradiation facilities deliver only hard gamma rays (4000 Gy/h), so materials can be irradiated without making them radio-active. PEARL is a neutron powder diffractometer for measuring diffraction patterns in order to determine where the atoms are in their crystal structures. Spin-echo small-angle neutron scattering: is a new technique for using small-angle neutron scattering to study the structure of systems on lenght scales of 10 nm up to 15 um in real space. The classical version of small-angle neutron scattering - instrument under construction. Poly Axis Neutron Depolarization Analyser: has been designed to perform 3D neutron depolarisation measurements on ferromagnetic materials. This neutron reflectometer uses a narrowly collimated (polarised) neutron beam to illuminate a flat sample at small glancing angles. To study layered structures of up to 500 nm thick. The world’s most intense positron beam (4x108 s-1 at the sample) is guided to a 2D-ACAR arrangement that allows for electron momentum distribution studies. In parallel, a 22Na source is in use for Doppler broadening measurements to study defects and vacancies. A multi-element analysis capacity for 67 elements of 4500 samples per year, ISO 17025 accredited and non-destructive. The Mössbauer effect allows one to investigate the electronic environment, that is the chemical state, of various elements. Widely applied for developnment of catalysts.